A loving marriage is filled with happiness, adventure, romance…and sometimes clutter. Despite your best efforts to keep things in order, you may find there isn’t enough space for both you and your partner’s various toiletries and knick-knacks. Between hair products, make-up, facial creams, shaving kits and other hygiene products, your countertop, sink or drawer space may be taken up. It can be overwhelming when you’re getting ready for the day in the morning or when you’re getting ready for bed with a nighttime routine. Your bathroom should be more than just a functional space; it should free you from your chaotic and stressful days, even if only momentarily, not add to it. There are many ways that you can maximize the traditionally smaller room to make it more spacious and amplified. When opting a bathroom remodel, consider the various techniques that can improve your mood and maximize the space without adding square footage. Two sinks are often better than one. 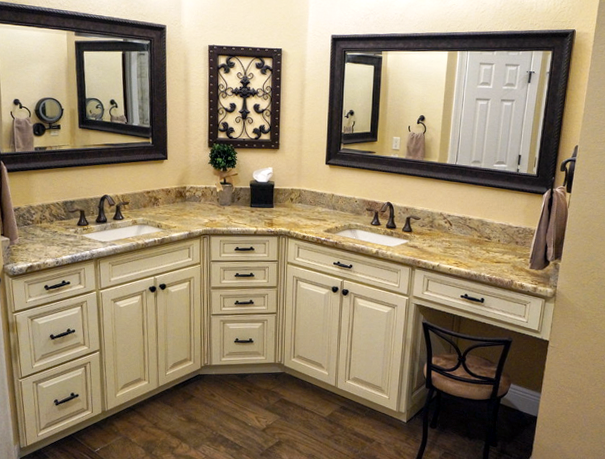 A double vanity provides ample space for both you and your partner. While there are many styles, one way to maximize space is to use the bathroom’s corners. The photographed bathroom, one that we’ve recently remodeled for a customer, shows this innovative technique. Secondarily, large mirrors are an excellent way to enlarge your bathroom. They will accentuate your double sinks and offers unparalleled personal space. When styling your space, consider topping your counter with granite or quartz. Granite is wildly popular, recognized for its beauty as well as its many unique appearances. Quartz is a beautiful manufactured product made in a wide variety of colors and finishes. Remodelers sometimes favor quartz for its low maintenance needs and stain resistant properties. Whether you select one or the other, opting for tranquil and refreshing colors can set a soothing (or energetic) mood that improves your morning regimen. Another stylish way to increase space is to incorporate hanging cabinets. By doing so, you can take advantage of the cabinetry space you need for storing toiletries you don’t want in plain sight. Depending on your needs, you could even customize drawers and cabinets to be optimized for the specific items you intend to store. If a full remodel is not in your immediate future, consider other methods to enhance your restroom. If you have an empty wall, for example, it could be the perfect place for you to hang floating shelves. You can add one or several, and they can function as décor or additional space. Additionally, hooks can be helpful in organizing the space and reducing clutter. Lighting is another area to consider. The right fixture can make your bathroom appear bigger and brighter. 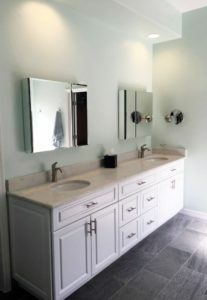 If you have a double vanity you can install lighting near both so you both enjoy prime illumination. Don’t forget to purchase dimmers so your room can match your mood – energetic and bright in the morning and low lights in the evening. As with any home renovation, remodeling or makeover project, one of the first steps is to think about what you want to achieve. For ideas and assistance, we invite you to share your thoughts with our talented team of designers. Our team is always happy to assist, and are available for free in-home consultations. 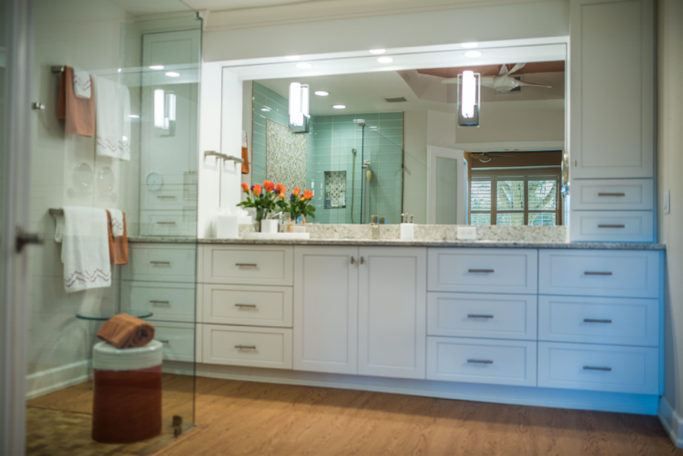 When you’re ready to transform your current bathroom into your dream, contact us online or via phone at (239) 332-3020.